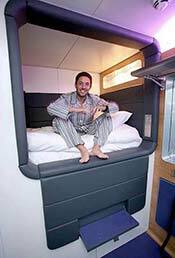 LEFT: Yotel CEO Gerard Green shows off a standard cabin at the Yotel in Schiphol Airport. You really don't need to stay at an airport hotel in Amsterdam, because Schiphol Airport is close to the city and trains run from Centraal Station to the airport at all hours. Still, if you want to stay near the airport, you can compare locations, rates, on Booking.com's page of hotels in and around Schiphol Airport. Sheraton Amsterdam Airport Schiphol (4 stars), a large, well-equipped, full-service hotel that is connected directly to the airport. CitizenM Amsterdam (4 stars), a modern, hip, and reasonably-priced hotel with a youthful vibe. It's a couple of minutes by covered walkway from the restaurants, shops, and train station at Schiphol Plaza (outside passport control and customs). Yotel Schipol Airport, an ultramodern hotel with small "cabins" that is located inside the airport's transit area, near the departure gates. Tip: One of the more intriguing hotels at Schiphol is the Yotel, which offers shiplike cabins for one or two guests in the secure area of the airport, with day or nighttime stays of four hours and up.